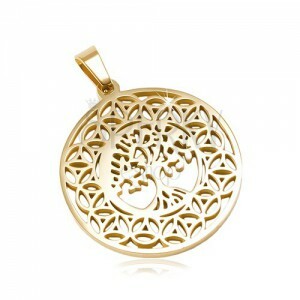 Steel pendant in golden shade, big shiny circle with ornaments around the perimeter and the tree of life in the middle. Stainless steel pendant has a circular shape and a shiny surface in golden colour. It represents the symbol of life - a tree with patulous branches. Around the tree is placed a wide rim made of ornaments. The eye for the chain is shiny and elongated.